It’s “Brains over Beauty” for India & South Africa! This weekend two major pageant nations crowned their leading beauty queens of the year. India, which has won 5 Miss World crowns & 2 Miss Universe crowns, crowned the 21-years-old Aditi Arya of the capital city Delhi as the Miss India winner in a gliterring ceremony in Mumbai. 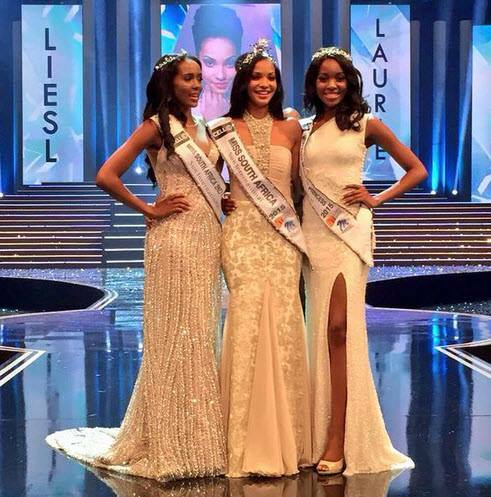 South Africa, which has won 3 Miss World crowns & 1 Miss Universe crown, chose Liesl Laurie as the new winner. Both the girls will compete at Miss World pageant to be held later this year. Liesl may also compete at Miss Universe. Aditi Arya was among the strong girls and in the prediction lists of many. But no one really expected her to get the top prize. The girl is tall, lean and well-spoken. Her professional experience vouches for her communication skills. However, there were prettier girls. The top favorite was Vartika Singh of Lucknow who won the Miss Photogenic & Beauty with purpose subtitles. She had to suffice with 2nd runner-up spot and will be India’s bet at Miss Grand International in Thailand later this year. This is not yet confirmed by Femina Miss India organization though. Other big favorite Deeksha Kaushal with an enviable modelling experience and her “European Goddess” face failed to crack the Top 3 inspite of making it to the Top 5. 1) India achieved huge success in 1990s and early 2000s simply because girls were chosen based on communication skills. They were “personality queens”. Of course, they were beautiful and fit. But having a good personality was the prime requirement. 2) Last year Koyal Rana of India had everything that it takes to be a Miss World, except one or two qualities. She has the face, the body and the glamor quotient which matched with eventual winner Rolene Strauss of South Africa. However, she was a little weak in speaking skills and stage presence. Her confidence levels were not very high. Even in Miss India finals, she could not answer her final question well, but to everyone’s surprise she won! It seems Femina Miss India has tried to play it straight this year but having a fair contest (at least the last round) and crowning girls based on their speech. We would like to point out one thing – the best girl may not be Aditi but Aafreen Vaz. But Aafreen does not have an Indian passport, hence she is not eligible for Miss World (as Miss India) and thus the main title of Femina Miss India. The very next day Liesl was chosen as the winner of South Africa, the most successful country in Africa when it comes to pageant. Now this was a huge surprise to many because the big favorites Chanelle Sardinha & Taryn Morris who looked breath-taking during the finals, were not even allowed in the Top 5! Nicole Lambert, the tall lass, was in the Top 5 but could not make it to the Top 3. Fourth in our favorites was Liesl, who has a very charming face and an endearing personality. Her way of speaking is adorable. She was chosen as the winner with Ntsiki & Refilwe as surprise runner-ups! Again, those who follow Miss South Africa will agree that the pageant gives a lot of importance to personality. Liesl has a very charming and standout personality. Chanelle has an aura & a stellar presence, but yes in terms of personality she is just about decent. Same can be said about Taryn & Nicole. Chanelle Sardinha looked stellar even during Miss South Africa finals. We wish she returns back next year. The case is not much of a surprise for South Africa because they have always followed this formula. Every year they follow this formula. There are times when they strike gold with a winner who is extremely beautiful in addition to being eloquent, e.g. Melinda Bam, Rolene Strauss, Nicole Flint, Tatum Keshwar, etc. But still, personality has always been a paramount criteria in selection of Miss South Africa. We appreciate that the pageant sticks to its character and courageously chooses Liesl as the winner. While Chanelle could have cracked the Top 5 at Miss Universe, Liesl will be a winner who will win hearts and make a good impression about her country, no matter how well she does at pageants where she goes. Pageant history is full of times when a girl with more personality won over the most gorgeous lady. It happened in Miss World 1999 for sure when Yukta Mookhey of India won over Martina Thorogood of Venezuela with her sophisticated and classy demeanor. Personality is, was and will always be a quality that cannot be separated from beauty. It is really good that few countries, who seem to forget this, get timely reminders and they come back on the right path. There will always be beautiful ladies. We rely on beauty pageants for sometimes providing us with women of substance like Rolene Strauss, Sushmita Sen, Mpule Kwelagobe, Megan Young, etc. Comparison: Paulina Vega v/s Miss World 2014 beauties!